You should make sure that you know the locations of the emergency exits for the rooms in which you have classes, and know the evacuation plans and emergency assembly points. 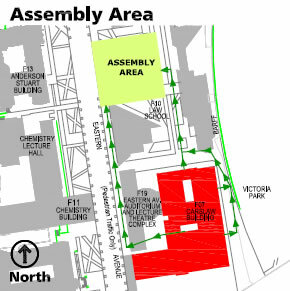 the emergency assembly point is on the lawn areas between the Law School and Eastern Avenue, alongside Fisher Library, as shown in the diagram below. There is a contact list on each floor of the School on the wall near every staircase, containing numbers of the First Aid Officers in Carslaw and useful emergency numbers. Lucy Kennedy, Level 5, Room 520, School of Maths & Stats. Brooke White, Level 4, Faculty of Science Dean's Office. Barry Napthali, Level 4, Room 496, School of Physics. Kristl Mauropoulos, Level 1, Science Marketing & Communication Unit. It is very important that all students obey simple housekeeping rules when in lecture theatres or visiting the School. You should keep your bags and personal items off the floor, as they present a trip hazard, and should use shelving or storage facilities where provided. Aisles should be kept clear and unobstructed. You should report all incidents and possible hazards on the University premises, including near-misses, to your lecturer or any other member of staff.